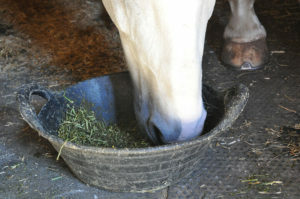 With so much feeding and management advice now available for owners of horses with Equine Gastric Ulcer Syndrome (EGUS), Dengie Horse Feeds commissioned a survey in 2018 to explore awareness and use of the key feeding and management strategies recommended. 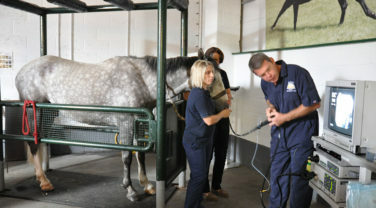 267 respondents completed a survey online, of which, 61% suspected or knew their horse had ulcers. However, implementation of these strategies by those who had horses with EGUS was lower. Only 67% were increasing access to hay/fibre and 57% were increasing turnout. This may be because of livery yard restrictions and so on and it is apparent that horse-owners are not always able to implement every recommendation. However, other easier to implement measures are not being used as widely as they might either. Only 56% were feeding a double handful of chopped fibre shortly before riding, for example. Even more surprising is the much lower than expected avoidance of starch/cereal – 38% of people are not doing this despite it being pretty much universally accepted as being beneficial due to the increased acidity in the stomach generated by feeding cereals. Encouragingly, owners are generally turning to professionals such as vets and nutritionists for the best feeding and management practice, whose advice is founded on evidence-based principles. It was very pleasing for us at Dengie to see that we were the company most frequently listed by horse-owners as being one they would go to for advice or products for horses with EGUS. We are fortunate that alfalfa is the basis of most of our product range and so our feeds are all inherently low starch, high fibre and therefore generally suitable for horses with this syndrome. However, we also have three products independently approved with the BETA mark for feeds suitable for horses and ponies prone to EGUS. It is vital to stress the independence of the BETA scheme — any approved feed in the scheme is subjected to independent scrutiny including by the government agency the Veterinary Medicines Directorate. As such it is the only truly independent mark relating to this condition. Impressively, 83% of respondents were aware that there are two types of gastric ulcers; those affecting the glandular region and those affecting the squamous region. This is important as we are really only just starting to understand the factors that contribute to the problem and how to manage it. Our next steps are to investigate why more horse owners than we anticipated are not implementing all the recommendations for feeding and managing horses with EGUS. Equine Gastric Ulcer Syndrome is the most common nutrition-related disease affecting horses in the 21st century. At the British Equine Veterinary Association (BEVA) Congress in September 2018, a whole session was dedicated to the glandular version of the disease, in which there was general consensus that — frustratingly — not all horses with this form respond to treatment. More than one speaker stated that there is no evidence that diet causes glandular ulcers; and this repeats what was reported in a consensus statement published by the European College of Equine Internal Medicine about EGUS in adult horses. In one study carried out primarily to assess medicinal treatments, the diet recommended for a horse with glandular ulcers was chopped alfalfa with additional oil and no cereals. The results presented showed 91% improvement and 53% resolution in one lower frequency of treatment and a 93% improvement and 79% resolution in a higher frequency of treatment. We are in no way suggesting the alfalfa contributed to the improvement in the ulcers but simply highlight that feeding chopped alfalfa appears not to have been detrimental in any way to the treatment of glandular ulcers, and was a dietary component suggested by the vet conducting the research.